Hello and welcome to the Colored Boston Terrier Message Board! This board is intended for you to learn about ALL the different colors of boston terriers, and to share information, pictures, and stories about our beloved bostons. 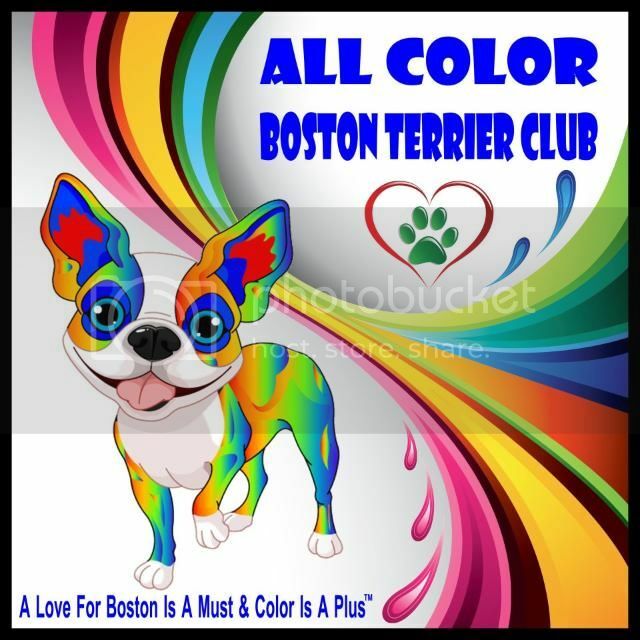 We hope it will be informative and fun for you to learn about Traditional and Non-Traditional Colored Bostons! Please keep posts positive and of a non-offensive nature. Advertising of any sort is prohibited on this board. Feel free to post all advertising on the COLORED BOSTON TERRIERS FOR SALE BOARD found at the link on the top of this board. Puppies/dogs you are keeping in your program MAY be posted on this board. You may post pictures of litters, just no advertising on THIS board. Any dogs for adoption MAY be posted on this AND the advertising board. These may include rescue dogs or spayed and neutered dogs from your program you are looking to place in stable homes. Thanks for your cooperation. If you need help posting pictures or have any questions contact ADMIN at coloredbostons@yahoo.com.